Giving Ground is prompted by two phenomena whose paradoxical convergence is currently altering our experience and conception of urban relations and city planning. On the one hand, forces of globalisation push towards conditions of homogenisation and deterritorialisation, while, on the other, a surging politics of identity barricades various groups behind particular claims and ignites violent persecutions. 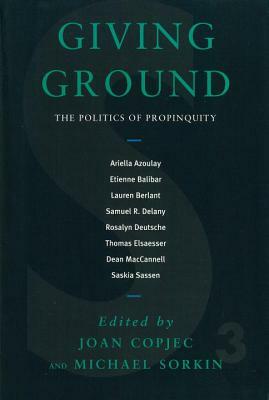 The covert relation between these phenomena, wherby territory/ground is both disavowed or abstracted and jealously reclaimed, is the focus of the essays in this volume, at the heart of these investigations are the notions of propinquity and neighbourliness whose redefinitions and redeployments serve widely divergent ends: from the fortification of the ‘new urbanist’ fantasy about the possibility of re-creating small towns, to the validation of the exclusionary tactics of ‘sanitization’ that guide zoning decisions, to assisting in the reimagination of an ethical and reasonable urbanism. Directed against the contracting limits of tolerance, this volume attempts to reinvent the troubled notion of the ‘right to the city’. The individual contributions range from examinations of the crises in specific cities—Jerusalem, New York, and the network of ‘global cities’ throughout the world—to considerations of specific urban issues, such as the physical instrumentalities by which people a brought into physical proximity and the implementation of ‘new urbanist’ projects; and reworkings of physical concepts, such as Levina’s notion of the face-to-face, Lacan’s notion of sublimation, in urbanist terms. Several focus on the relation between cities and sexuality, which figures, for different reasons, as the ‘eternal irony’ of urbanity. Joan Copjec is Professor of English and Comparative Literature and Director of the Center for the Study of Psychoanalysis and Culture at the State University of New York, Buffalo. Ariela Azoulay teaches political thought and visual culture at Brown University. Her website can be found <a href="http://cargocollective.com/AriellaAzoulay">here</a>. Étienne Balibar is a French Marxist philosopher and the most celebrated student of Louis Althusser. He is also one of the leading exponents of French Marxist philosophy and the author of Spinoza and Politics, The Philosophy of Marx and co-author of Race, Nation and Class and Reading Capital.